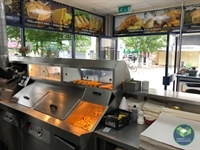 This well established business has been owned by our client since 2014 and is only for sale today due to our client’s other business commitments. The business achieves its current level of turnover, whilst offering further potential for an enthusiastic owner operator to increase the takings, by way of, for example, by extending the current opening hours to offer suppers, or perhaps introducing a delivery service. This business occupies a prominent corner site on a busy main road, close to Loreto College & offices. The business is surrounded by shops, salons, cafes, residential dwellings & also benefits from high levels of passing trade. The electrically shuttered, glass fronted premises with al fresco seating for approximately 12 provide window seating for approximately 8, service counter made up of 2 pan, 2 scuttle, 2 display box range, open plan kitchen with cold storage, 6 pot baine marie, 4 burner stove, washing up area & storage.